Don't want to use a third-party service? Reeder also supports local/standalone RSS (no sync). ...and more via sharing extensions. 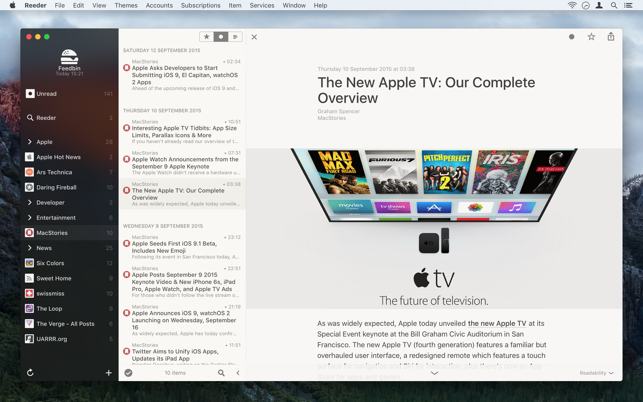 Reeder is the best way I’ve found to read and manage RSS services like Feedly. 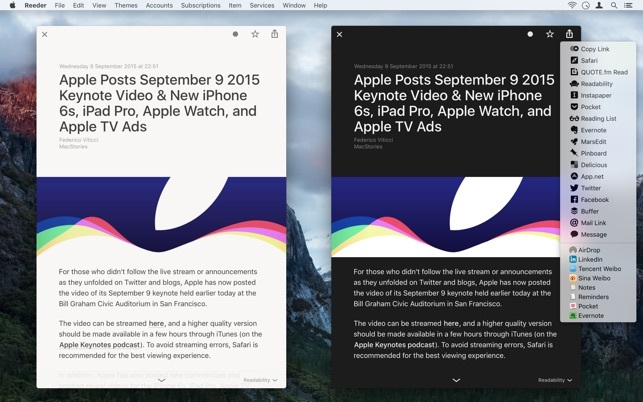 It also works great as a client for read-later services like Instapaper. (It might be the only desktop Instapaper client, as far as I know.) The app is full of features, but also very intuitively designed, meaning you won’t have to dig into settings if your demands are pretty simple and you just want to start reading. 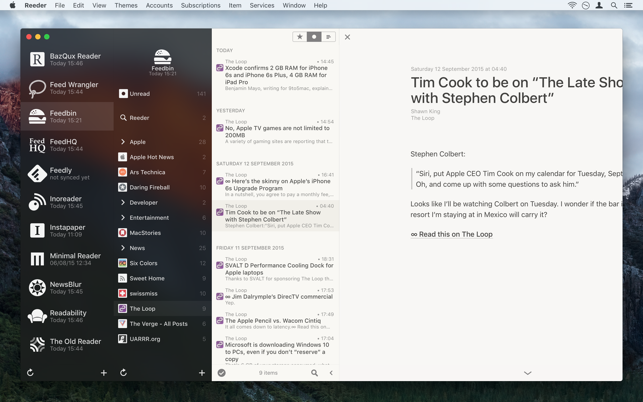 Reeder also looks great. 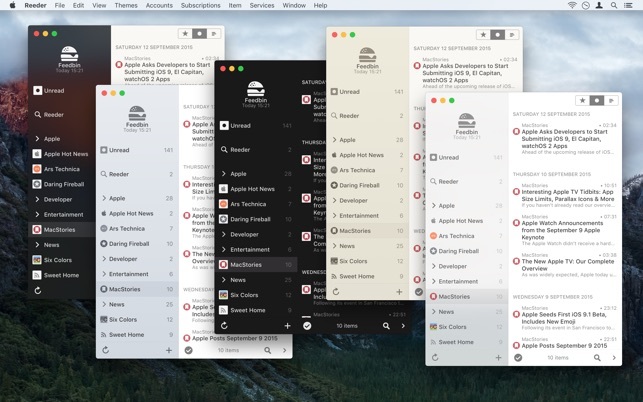 There are lots of included themes, and they make good use of native macOS flourishes like transparency. But, even without much in the way of competition, there are still features I’d love to see. It’s possible to use the built-in Mercury Reader service to reformat feed text in a way that’s pretty similar to Safari’s Reader View, but there isn’t a way to do this in Reeder’s built-in browser. And while Reeder has a pretty comprehensive “Services” menu with plenty of ways to share/export websites and feed text, there’s no way to add your own. There are a number of bookmarklets (like “Kill Sticky”) that I’d add in a heartbeat. This developer deserves your support. And, with that support, I hope the app continues to improve. It does a job - parsing diverse news feeds and making them easily readable (not an easy job, considering many sites don’t actually want you reading their stuff from an adless feed). Other readers either try to get too fancy or don’t do those basics properly. That’s why I love Reeder and have paid for it something like 5 times over since version 1. As long as it works for those basics, I’ll gladly pay for future upgrades as well. i have been using this app for years and with every new release of macOS it just keeps getting worse. it seems like the developer can't be bothered to optimize the app annually with each new OS release. i finally have given up using it because with macOS Mojave, just having Reeder open in the background uses so much of my system resources (looking at Activity Monitor right now and it's using 40.6% of CPU just sitting in the background doing nothing!!) that it noticeably slows down everything else on my mac, to the point where i'm getting the spinning beach ball of death just trying to open a new finder window or new tab in safari. i am not a power user by any means so it's not other apps causing this. once i close reeder, everything flies again. if this app was free, i wouldn't care, but for $10 i would expect the developer to support it ongoing. i'm deleting it from my mac and just going back to the feedly website.